Although Rob Satori is known locally as the "Sinatra guy," he also impersonates musical icons such as Van Morrison, Jimmy Buffet and Sammy Davis. Rob Satori conducts his life like a sheet of music. While the score shows passages of presto and of adagio, Satori’s passion for music remains his reprise. At 55, Satori’s aspirations haven’t changed, but most of his other musical endeavors — leading the music program at Unity of Sarasota church and disc jockeying, for example — pay the bills. But Satori’s compositional skills, in particular, have seen success in recent weeks. His classical piece, “Requiem for the Cherubim,” has landed at the top of the classical/romantic category chart on broadjam.com, a music publishing opportunity-site from which publishers seek material from musicians for radio, film and television. Satori wrote the piece nearly 20 years ago, after learning about the Oklahoma City bombing in April 1995. He put the disc away but after finding it a few months ago he reworked the song using symphonic sounds on new equipment. He hopes to have the piece scored for a full orchestra soon, in time for the 20th anniversary of the bombing that inspired it. In the meantime, Satori, owner of Rob Satori Entertainment, continues along a musical path. He explains his work as a tree of music, with his passion for music as the tree’s trunk and his musical ventures as its branches: piano lessons, songwriting, leading a church music program and even playing piano at assisted-living facilities — a business he developed after visiting his father, who had Alzheimer’s disease, in one and playing piano for him as a way to communicate. But writing music remains Satori’s utmost passion. “I write whatever I feel led to write, which is quite diverse,” he adds. His song list spans genres, from classical/romantic to pop to patriotic to country. The pieces published on Broadjam, for example, can be selected for soundtracks, commercials, movies or purchased just for listening. Satori says he’ll keep writing until his lifelong goal is fulfilled. Contact Pam Eubanks at peubanks@yourobserver.com. Local composer records students from the Sarasota Orchestra Music Festival for top - ranking original classical work. Bradenton, Florida - June 18, 2014 – Rob Satori’s brooding classical piece, “Requiem for the Cherubim” now ranking #1 on the Broadjam.com Classical/Romantic Top 10 Chart. Broadjam.com is a music publishing opportunity site where publishers seek material from songwriters and composers for Artists, Radio, Film and Television. In addition to making the number one spot, Satori’s Requiem has been selected by several publishing firms in Los Angeles, CA. Rob saved the disk on which he recorded the piece and found it a few months ago. He re-recorded the piece using hi-tech and hi-touch symphonic library sounds of today, along with a few Sarasota Orchestra Music Festival students, Chung Yoo on clarinet and Thomas Stuart on Violin. Satori, who directs the music program at Unity Church of Sarasota, heard the students when they performed there last Sunday. “I thoroughly enjoyed their performance of Brahms, it was seamless!” Rob commented, “I asked them if they would be interested in recording some parts to the Requiem and to my delight, they agreed.” Rob hopes to have the piece scored for full orchestra soon, in time for the 20th anniversary of the OK City bombing. 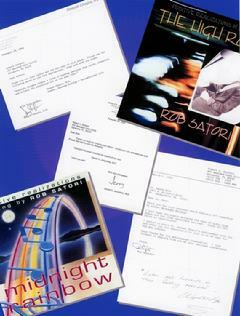 To Listen to samples of Rob Satori's music please click on the CD Baby buttons below. You may also purchase CDs after you've listened. Individual Songs are also available on iTunes! Listen to more of this CD before you buy! Just click on the link above! "Midnight Rainbow evokes a flood of healing emotions that soothe, stimulate and balance the physiology all at the same time." Deepak Chopra, M.D. "Peace is the Way"
"Listen and luxuriate in these soothing melodies." Dr. Wayne Dyer "The Power of Intention"
"Midnight Rainbow touches the depths of our soul." Gerald G. Jampolsky, M.D. "Love is Letting Go of Fear"
"Rob Satori's music elevates one to the heavens." Gloria Ponziano "Journey to Love"
Rob on Cliff Roles WSLR Radio "Can't Write a Negative Song..."